There is no doubt that Amazon India will come up with their own logistics service sooner rather than later, given the growth they are experiencing in India since their launch in June this year. However, even with their own logistics in place, it is going to be extremely difficult for them to reach to interiors of India. While it is relatively easy to cover the Metros and A cities, expanding their logistics coverage to smaller towns and villages will always remain a challenge. And, Amazon understand that. To overcome this issue, Amazon has started a pilot with India Post, reports ET. While Amazon India already uses India Post to deliver packages, they are now piloting Cash on Delivery model with them, where India post personnel will not only deliver the package, but also collect payment on Amazon’s behalf. If the pilot with India post is successful, it will give Amazon a huge edge over others, as it means they will be able to reach hinterland of India, giving them unbeatable logistics coverage. Even today, other Indian players like Flipkart, Myntra and others are unable to deliver packages to many villages and smaller towns in India. India Post covers a total of 25,000 pin codes in India, whereas none of private courier services have coverage of more than 10,000 pin codes, which gives India post a huge edge over others when it comes to coverage. 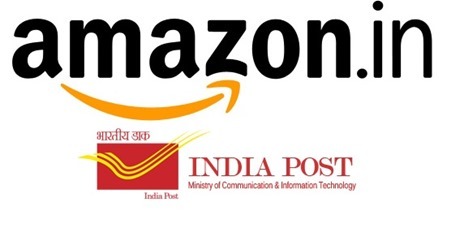 While this is great for Amazon, the successful pilot will also be a shot in the arm for India Post, which has been struggling for a while due to increased reliance on email and mobile for communication. Many India Postal services that were once a mainstay for Indians for communicating across the country are now hardly used due to telecom revolution. Successful pilot with Amazon means India post can start offering these services to other players as well. And given the way e-commerce is growing in India, this channel could become a big revenue generating channel for India post as well. ET has quoted a senior post official saying, “We are trying to add capabilities like cash on delivery and reverse logistics. Consumers don’t want to make an upfront payment. We are developing software to start the cash-on-delivery service with Amazon,”. It is interesting to note the stark difference between western world and India when it comes to e-commerce logistics. While Amazon has been in news in regards to testing deliveries via unmanned drones in the US, here in India they have to rely on humble post man to increase their reach! "Amazon Pilots Cash On Delivery Model With India Post", 5 out of 5 based on 1 ratings. What a fantastic strategy. 25,000 Pincodes is huge! People with access to rural areas in India and going to be thrilled! Hope the pilot goes well.. It is simply because people in India atleast most of them don’t want to pay through their debit cards and still prefer COD safe. Also because some of the eCommerce site have been delivering faulty products or atleast products which vary from the ones shown at their site..
@Kaxil, Absolutely right. But here this is huge thing not only for Amazon and their customers but India post as well. They can revamp and revive themselves, if they are able to successfully complete this pilot!